The Ohio Historical Center is going through a major overhaul-- in fact, the first major overhaul in the last 20 years. Part of that renovation is photographing every item in storage and creating a digital database of these items. Conway Mastodon that is on display at the Ohio Historical Center. This skeleton was found in 1887 in a swamp located between Champaign and Clark counties in Ohio. 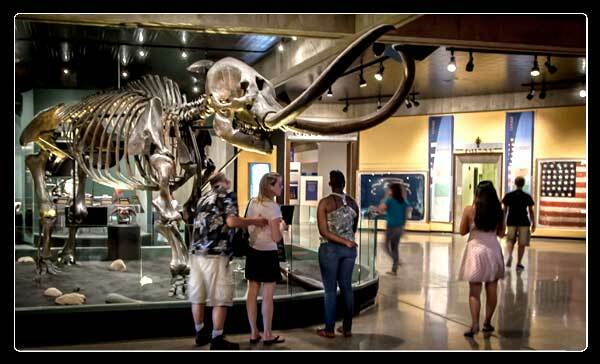 It is known as the Conway Mastodon because it was presented to The Ohio State University by Newton S. Conway in 1894. The skeleton came to the Ohio Historical Society in 1970. It is estimated that this mastodon was 20 to 30 years old when it died. It stands 10' high at the shoulder and each of its ivory tusks weighs more than 100 pounds. 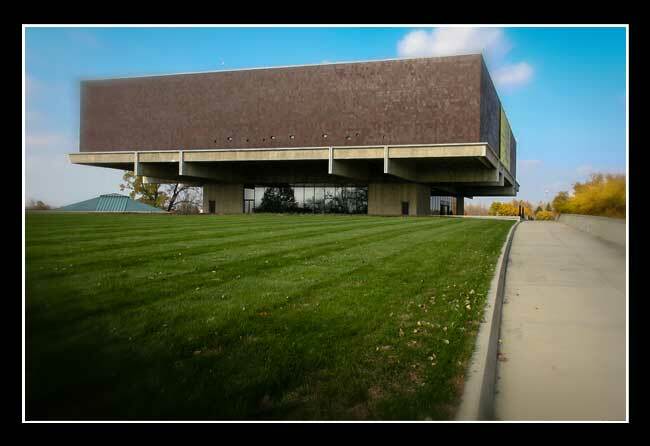 The Ohio Historical Center showcases more than 1.5 million objects about Ohio's history, from the ice age to the present and is the flagship museum in the Ohio Historical Society's statewide system of 60 historical sites. This 250,000 square-foot structure is also houses the gift shop, a 280 seat auditorium, and the society's Archives/Library, which includes the State Archives of Ohio. Other exhibits spotlighted in the Center is Ohio's archaeology, plants, animals, geology, geography, climate and weather. The Ohio Historical Society began as a non-profit organization incorporated in 1885 with the mission "...to promote a knowledge of archaeology and history, especially in Ohio." 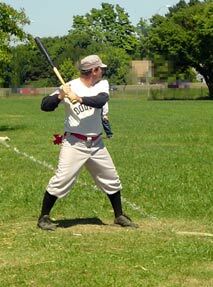 The organization was formed to interpret, preserve, collect, and make available evidence of the past, and to provide leadership on furthering knowledge, understanding, and appreciation of the prehistory and history of Ohio and of the broader cultural and natural environments of which Ohio is a part. 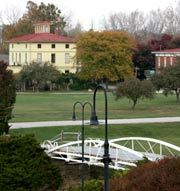 The organization has management partnerships across the state with important historic Ohio sites so that they can remain open to the public. In 2014 the society officially changed its name to the Ohio History Connection in an effort to appear more contemporary and make Ohio's history more accessible to all Ohioans who may have been put off by the name "Society" so the decision was made to update the organization. Located inside the impressive building is the Ohio History Store. The store offers a variety of books, magazines, posters, ceramics, historical reproductions and fun products related to exhibits inside the museum. The Ohio Historical Center is located just off of I-71 on 17th Avenue on the Ohio State Fairgrounds (exit 111) which is about 4 miles north of downtown Columbus. Adjacent to the Ohio Historical Center is Ohio Village. The Village is open to the public for special public events, school groups and private events. Christmas is an especially nice time to visit the village. In 1970, the American Institute of Architects applauded the Ohio Historical Center as a "bold, imaginative, almost startling structure." The Architectural Record called it "the most architecturally significant public structure built in Ohio since the State Capitol Building." W. Byron Ireland & Associates, a Columbus architectural firm, designed the Ohio Historical Center building. As the center's hours and dates open have been fluctuating, please check their web site for days, current hours and costs.